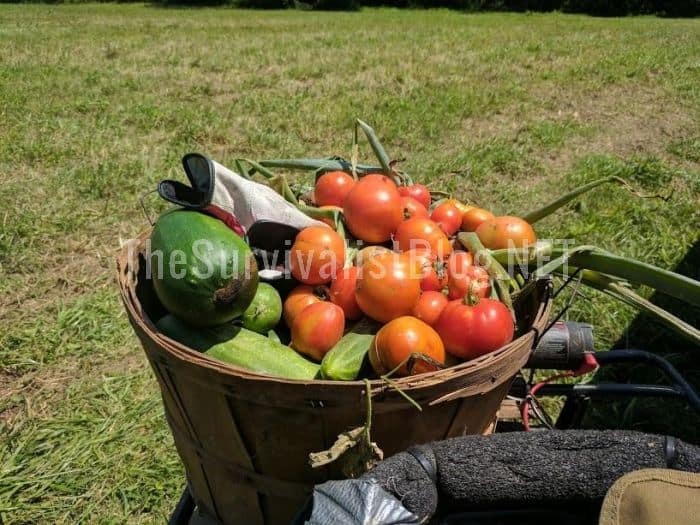 It is harvest time here on our survival homesteading retreat. We picked and then began processing, about 620 ears of corn on Monday. I was so tired I lost count, even though I was tasked with keeping it. We ended up giving a good bit of corn away to tribe members and then cheated a little bit – at my sleepy eyed insistence and froze some whole ears. They will still taste great, the only side to that method is the amount of space whole ears take up in the freezer, but thanks to the on-site butcher shop, space is not really an issue. Our corn did a lot better than last year, thanks to my companion planting and natural DIY earworm protection methods – at least in my humble opinion. But, the Japanese beetles and this wildly unpredictable weather with intense humidity followed by torrential rains, wreaked havoc on our green beans and cucumbers. Keeping in step with the training them up as you want them to go mantra, Colt and Auddie got dirty and sweating with the grown-ups during the weekend harvesting. Colt helped to plant and raise the corn and I thought it would be highly valuable for him to be a part of the picking and preserving process as well. Auddie was the potato picker helper. “There’s one!” she would yell with great excitement each and every single time she saw a potato…I think she thought it was an Easter egg hunt! She called the tiny potatoes that will be used for seed next year, “babies” and the bigger potatoes “momma ‘taters” it was beyond adorable. She and her Papaw would sing, “Pickin’ up ‘taters and puttin’ them in the basket” during the great potato hunt of 2018. I was not in a singing mood. I had been standing on this hook-like tractor attachment thing that was not working properly to dig down into the dirt enough to scoop the potatoes out of the ground. No clue what this little attachment is called. But I can say with absolute clarity that it is extremely difficult to stand on it with both feet while it is digging and sometimes hits a rocky area hard and bounces you nearly into the air and then suddenly goes down super deep in the ground and almost getting stuck. I stood on the moving farm implement while holding onto the roll bar on Matty’s tractor. Bobby recently bought Matty’s tractor, I’m sure it remaining “on the hill” makes him happy. 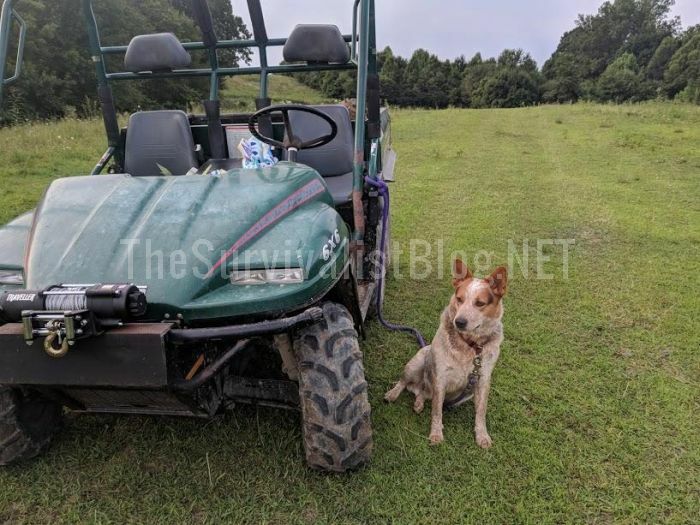 After nearly falling through the metal bars that surrounded the digging implement from hell a few times, Bobby decided it was time I learn how to drive the little diesel tractor. I am short, so reaching and holding onto the roll bar was a tad bit interesting. Guess I at least got a decent workout during my ride along. We have an old-fashioned push potato digger farm implement – yep, not sure what that is called either, but perhaps I will do better using it! After killing the tractor a few times, back up on the digging hook thingy I went. In the end, we got the potatoes dug, no injuries occurred, and the problem, whatever it was, is not fixed. My tomatoes did superbly though. I am so proud of my Thomas Jefferson tomatoes, hopefully my favorite president would be too! They produced far more than 50 pounds per plant! Bobby loves using cages and I prefer staking – but we had to do a little bit of both to keep the Thomas Jefferson plants from folding over onto the ground. These are average Thomas Jefferson tomatoes. I placed my laptop mouse next to them so you could get a better idea of their true dimensions. They are simply delicious, and not just because they are the great, great, great “grandseeds” of seeds planted by a Founding Father. They are probably the juiciest and easiest to raise tomatoes I have ever come across. I ordered the seeds from the Monticello gift shop (very nominally priced) and started them indoors late – too late according to my beloved Bobby….and yes, I loved proving him wrong. My other preps this week included more sorting of Bobby’s junk pile for possible usable materials (his sheet metal collection is now fairly enormous) and working with Jovie and the horses. She wants to herd and when I would prefer she did not, which prompts the herd to run every time they see her walking in their direction – except for one stubborn mare. Well, when they horses run, Jovie gives chase and complete chaos results for a few brief but intense seconds until the barnyard queen (that would be yours truly) commands calm. It took a few weeks of practice, but the horses now understand that when I part the Ranger or the 4-wheeler I will tie the spunky beast to it while I do what I need to do with them or in their vicinity. The herd also can now grasp that part of the routine will be letting Jovie loose – in an ultra calm state, to walk about kinda near them before I turn the key in the ignition. I need for the herd of horses and other livestock, though Jovie really only chases the horses, to understand that if Jovie is herding them to the barn or anywhere else it is for their safety and they must comply quickly. Having a pair of quality herd dogs as well as a pair of top-notch livestock guardian dogs is useful now and can mean the difference between life and death, during a long-term doomsday disaster. I am still a novice at canning on anything other than a traditional oven. One of my prepping goals this summer was to learn how to can over an open flame, on the wood burner, and on the most exciting addition to any homestead – a wood cook stove. It was my prepping pal, Melissa Norris, who first made using a wood cook stove seem like a not just a feasible, but reliable idea to me. It takes practice, but the learning time is well worth the effort. The key to cooking anything, let alone canning, on a wood cook stove is to start with an established fire. The stove’s surace must have a steady heat going in order to boil water or to prepared something thick, like meat. For the past three years I have used cast iron cookware exclusively, even with my traditional stove and oven. You definitely need to use cast iron on a wood cook stove, it retains heat incredibly well and is ultra durable. You can’t ruin cast iron no matter how hard your try – you only have to use baking soda or cornstarch to remove light rust or sand away heavy rust, and reseason to prepare poorly maintained cast iron (or cast iron used to can with a recipe that contains vinegar) to be ready to hit the stove again. If you have an established fire going, it really won’t take any longer to fry meat or boil water on a wood cook stove than a regular stove. But, it will take a lot longer to fully cook a meal, much like when you use a crock pot. The only other prepping we did this week, besides a little shooting practice, involved dealing with Pearls’ high-energy kids. They are putting on weight far more slowly that Rooster, Pearl’s first kid, did. I am going to add some molasses and coconut oil to their diet – they are eating a little bit of grain and hay, to see if that will help. Until they get past hawk bait weight, they cannot free range with the rest of the goat herd. 1. How did your garden grow? 2. Do you prep alone, with extended family, or a tribe – and why? 3. Do you set weekly, monthly, or seasonal prepping goals…and regularly achieve them? How did my garden grow? It didn’t but the deer are looking fat. We prep alone but have an extensive network of local preppers . As far as goals it is more of what do we want to learn or do next . We never give it a set time to do it in . As far as done this week , Add to the but ,bolt,screw and nail stash. Did a class on grain storage . Did a presentation on rolling your own oats and why . Also harvested this years supply of Mountain mint . As mentioned a while back we have an Expo coming up October 11-13 here in Hohenwald Tn. Look us over and keep in mind that the classes are onlyna part of this event . There will be demonstrations areas and venders there. A wood cook stove ever make that 2 will be setup and cooking as well as a kettle on a tripod . Blacksmithing forage w/ hands on . Try your hand with a crooscut saw and so much more . Here’s the link . Since I think most were expecting this column on Sunday and they have move this to Saturday, you and I get to be #1 & #2. I would love to come down to your Expo in Hohenwald TN; but since I don’t drive and I would not task the DW with a nearly 500 mile and 8 hour trip, I will just have to live it through your reports here on the subject. I hope you have great weather and a good event, keeping in mind that I am admittedly a bit envious. Oh, I love the idea of having this column on Saturdays. It’s not the spot I need, Since I am quite ambulatory, it’s the transport to & from distant locations. Saturday or Sunday is fine with me, someone needs to just pick one and stick to it. Holy Cow! One of the Salatins will be there! I’m in! Most in the homestead /prepper rural types know of polyface farms . Joel Salatin founded it . Sheri Salatin runs marketing for them . It is one of the most successful homestead to consumer type operations out there . There a podcast on the above link. Most in the homestead /prepper rural types know of polyface farms . Joel Salatin founded it . Sheri Salatin runs marketing for them . It is one of the most successful homestead to consumer type operations out there. I’ve never heard of them and I suspect most of my neighbors also have not; but, I’ll ask around. When you say: “homestead /prepper rural types” I guess I think of some kind of movement; but, around here it’s more of a lifestyle that most live day to day. In any case, thanks for the link. I’ll check out the podcast. As fixit said, Joel Salatin & Polyface Farms is one of the most recognized names in the Clean Food Movement, the Prepper world, and Permaculture. I believe he & his family are also Christians. I have a Komo FlicFloc for rolling fresh oats. About $150 from pleasanthillgrain. I also get my organic oat groats from them. Did my 1st of the month bill paying and shopping; Costco, Harbor Frieght, and Sportsman’s Warehouse; mostly hard goods – folding tables, chairs, and 45 qt clear storage tubs. Also order some AF Sale #10’s. Checked another box off my “preppers list” with 2 PSA bolt carrier grouups for the spares box. Thanks to a posted recommendation. Started our “we are going to move someday” house cleaning. Took 4 bags of good, used clothes to the Thrift Shop, bagged up a bag of trash (clearing off 1/2 the dresser top) and making more room. 1. No garden to date. Got an above ground planter for potatos and getting the front yard space ready for berries (blue, rasp, and wild straw). 2. We are solo, but have several connections but our circumstance and available resourses are different. 3. Goals – nothing that is specific. We are working hard on our debt, add to our stash (at about 95% of “comfort level” as things come on sale. I haven’t been to Montana in decades but I seem to recall short growing seasons. How do you compensate? Our average last frost is Mother’s Day and the first frost can be as early as the 3rd week in September although one year the first freeze was Monday of Thanksgiving week. Makes it tough to plan. Yes, the seasons are short. But there are species that grow here well. I found some wild strawberry plans that I hope to transplant in my yard. I figure if they can survive here year round, they can survive my yard. We can get a season or maybe 2, depending what you are trying to grow. But all things considered, perservation of the harvest is very important. We stopped growing corn some years ago, since either the BIL or his oldest son always plant a full planter roe or two (8-16 rows) of sweet corn, and we all pretty much get all we can use. We still laugh about a mistake a decade or so ago, when they bought some bulk sweet seed corn and didn’t pay close attention to the maturity date that was the same as the dent (field) corn and they cross pollinated. We still had corn that year; but, it wasn’t quite up to the standard we were all used to, and he still hasn’t lived down that error, LOL. I’ve been watching the weather for the state and you all have been getting a lot more rain and tons of fog that we rarely see up here. That however is pretty much standard for Ohio, considering we had a thunderstorm come through here a few nights ago with tornado watches and our location receive 0.4 inches of rain in about 15-20 minutes. Friends, who live about 6 miles to our southwest and southeast, didn’t get a drop. Colt looks a bit small to pick the corn, since I often get overwhelmed in the middle of a field with a forest of stalks taller than I am. We joke about needing a compass to get out of some of those fields. If you need to ride that potato digger again, I would consider a welding project with perhaps a seat and pegs for the feet, or at least a good handhold. 1. We’ve setup periodic distributions from an IRA and an Annuity (IRA) and those funds have started flowing adding $ 700+ to our monthly cash flow. A lot of this cash will be banked after minimal tax payments, trying to make the MRD (Minimum Required Distribution) as small as possible in another short 3 years. I’ve saved and planned for 40 years to have a good retirement; but, now the tax code makes us do even more planning and calculations than we did prior to retirement. It just never ends. 2. Received some Velcro attachment key rings to add stuff to the EDC. 5. A MAG member brought over some late tomatoes, some cucumbers, and a few tomato plants that we will try to winter over in the new greenhouse. I’m urging him to join us here for his insights, since he used to read and post on the other site. He’s a master gardener (not in title only), dairy farmer, and a bee keeper, recently pulling off 20 gallons of honey from his hives. 6. Ordered an AstroAI TRMS 6000 Digital Clamp Multimeter from woot.com, It’s another tool for the inventory that I was lacking. 7. Picked up 3 ”Easy Home 3 Tier Chrome Shelving” from Aldi’s for $14.99 each. I have others of these from a few years ago and thought I had missed their annual spring shelving sale, normally in April. They assemble like the larger units; but, are smaller and more compact @ 23″ x 13″ x 30″ with a 160 lbs capacity per shelf, 480 lbs total. 8. Thanks to a mention by tuckerhollow, we hit the local Rural king for Mrs. Wages Sweet Pickle Relish mix. While they didn’t have it, we did find and purchase Mrs. Wages Sweet Pickle mix, Mrs. Wages Chipotle & Garlic Salsa mix, and another ½ gallon of white vinegar. We also purchased another Swing Away can opener, some Clays (since 1919) Sassafras, Root Beer, and Raspberry candy. On the way out the door we noticed a bin of spices and snagged cinnamon, cinnamon sugar (2), and poppy seeds for $0.89 each. 9. Another pair of bug zapper night lights on clearance @ TSC, while purchasing some additional cat food for the local animal rescue run by our MAG member neighbors. 10. Also while at Aldi’s we found and are trying Bacon Ranch Dip & Dressing mix and Buttermilk Ranch Dip & Dressing mix, plus some tortilla chips, goat cheese with honey and goat cheese with garlic & herbs and a gallon of Vanilla Bean Ice Cream. 13. Purchased a Powerstat Variable Autotransformer model 116BU: 50/60 Hz single phase 120 VAC In, 0-140 VAC out @ 10 Amperes, 1.4 (KVA) @ the Columbus Hamfest, that pretty much fills the last need I had for test equipment. BTW, That Autotransformer cost me $20.00 and new ones online go for north of $100.00. Instead of buying veggie dip, try this five ingredient dip–equal parts mayo and sour cream, then add dried dill, Italian seasoning and garlic (to taste). Mix together. It’s better if you let sit in frig for a few hours or overnight. This is awesome–better than any store-bought dip. I’m not sure what you mean by Italian seasoning; but, we’ve made dip of our own for years with sour cream and other things, from Onion Soup mix to a combination of onion and garlic. These mixes were $0.29 each and are mixed with 1 cup milk and 1 cup mayonnaise for salad dressing or 16 ounces of sour cream for dip. While we can make dip, dressing, and even soups from scratch, sometimes having a long shelf life package to accomplish a task, like these or the Bear Creek soup mixes, or the Knorr pasta sides can buy you time, and sometimes the time is a more precious commodity. All of these are better when left to sit in the fridge to ruminate for a while to co-mingle the flavors. Be careful. Many of these mixes contain the chemical Monosodium Glutamate (MSG). And excessive salt in order to preserve shelf life. I’ll have to check; but, a little MSG doesn’t bother me, since it’s just another salt, in this case made from sodium and the amino acid glutamic acid instead of sodium and chlorine. It is found naturally in tomatoes, mushrooms, broccoli, peas, walnuts, soy sauce, and some aged meats and cheeses. Glutamate can act as an excitatory neurotransmitter in the brain and has been reported to cause headaches in some people; but, I am not one of them, so it’s not something I avoid, other than to keep track of my general sodium intake. The MSG added to your food supply IS NOT the same as what your body produces naturally. It is a dangerous chemical cocktail that is capable of producing very serious health issues. Much in the same manner as artificial, chemical sweeteners. Natural News, Mercola, and Dr Axe are all good sources of information, as well, just for starters. The MSG added to your food supply IS NOT the same as what your body produces naturally. I beg to differ. Chemically it is the sodium salt of glutamic acid, one of the most abundant naturally occurring non-essential amino acids with the chemical formula: C5H8NO4Na regarless of how it is created, synthesized, or extracted. It is a dangerous chemical cocktail that is capable of producing very serious health issues. Much in the same manner as artificial, chemical sweeteners. It’s not a cocktail at all; but, a complex salt, as you can see from the formula above and is no more a cocktail than other things like Epsom Salt: MgSO4. In any case, I checked the package for the Aldi’s dip & dressing mixes, and they contain no MSG. MSG increases the speed with witch Neuropathy progresses for foot level to up the leg,.. as does GMO corn. experience . takes about 2 months of GMO corn free products to see a return of proper sensation with herbal/natural treatment…has not ceased yet, but improved over when was using regular corn chips heavily..
MSG increases the speed with witch Neuropathy progresses for foot level to up the leg,.. as does GMO corn. experience . If you have neuropathy or other symptoms from MSG or any food or food additive for that matter, then by all means you should not use those products. If you are allergic to peanuts or tree nuts, or soy protein (like my DD) then you should avoid those. I have not had any issues with any food or additive, so I will continue to use (in moderation) anything that does not have harmful effects on me. We each have our own unique metabolisms, and should restrict our intake to foods that pair well for each of us as individuals. takes about 2 months of GMO corn free products to see a return of proper sensation with herbal/natural treatment…has not ceased yet, but improved over when was using regular corn chips heavily.. I have no symptoms of neuropathy or any other lack of sensation, except of course for my vision issues that had more to do with high fat and cholesterol intake 40 years ago. I eat what may be GMO based food when I eat Fritos or Doritos, at a rate of perhaps 6 small individual serving bags per month. DH & I do not eat sour cream, but we do find plain yogurt works well in any recipe calling for sour cream. We do eat sour cream in moderation; but, for dips we’ll often get the low fat version, or just use plain yogurt. There’s not a lot of difference, since both are just cultured milk, and you can make a reasonable substitute from milk, heavy cream, and a bit of vinegar if needed. TARA – will this feature appear on Saturdays now? I have 3 sites on mewe, and I have invited them over. One of those sites is “Prepared Seniors & Friends”. It has been up less than 2 weeks. I am very excited about the growth rate! Of course, this does take time every day, as you well know. I have 3 sites on mewe, and I have invited them over. I’ve been meaning to get back to you on the mewe.com site; but, this is as good a place as any. I went over there and unless I’m missing something, they require me to establish an account to participate, which means keeping track of yet one more set of credentials, and splitting my time here and other places into smaller chunks. Is there a way to participate there without an account? mewe does not track, collect , sell or share your info. It’s a good way to connect with like-minded, and another way to learn. I run a tight ship, however. Brings in the right kinds & loses the others! I don’t need to tell you not to use your “real” name! I understand all you’ve said; but, in the end I’ll still need to maintain another set of credentials on top of the 20 or more I already have. I’ll see. To answer your question on the account, OP, I do think you have to create an account. However, all you input is a name & password. They don’t ask for date of birth, phone #, yada yada. They DON’T CARE. To answer your question on the account, OP, I do think you have to create an account. However, all you input is a name & password. They don’t ask for date of birth, phone #, yada yada. The name and password are just another thing to keep track of along with the more than 60 I already need to manage, so I’ll see. Livinthedream, Did you have a different name on the old site? When MD owned this one? Yes. But I think someone else may have used this name somewhere along the way. I tried checking out another site at someone’s suggestion, only to find I had been blocked from that site. But I had never been there. Who knows?! O.P. and I have been blocked as well. And I for one haven’t evenlooked back at the site. If you have never been on any site, and wish to go there,… contact the site owner. they usually have a contact link… for issues.They can get you in.and get system to recognise you. I suspect that may be the problem. Some of you may recall that prior to 2015 I was simply OhioPrepper; but, during the months I was down my domain for ohioprepper.org expired and some domain squatter snagged it and wanted $800.00 to get it back. That was when I setup TheOhioPrepper.org and set up my new Nom De Plume by the simple addition of “The” in the name. Prior to that on the other site, I had someone accuse me of being a fraud, based on my YouTube videos, even though I had never nor still have any videos there; but, a quick search showed a guy calling himself OhioPrepper who was rather obese and simply talked into a camera from his couch. Point of fact is that none of us have registered our names as trademarks and except for using the Gravatar as Tara and a few others have done, our names are all rather freelance and open to copying. I have plans to set up my own Gravatar, as soon as I get around 2 IT. LTD, I am not sure and will have to check with Dan on that. I generally write the articles on Friday so I guess it depends how long it takes him to work the publishing magic on his end to get it up. I am not sure if the Saturday publication was intentional this week and a permanent thing or just a timing issue. I, too, want a wood-burning cook stove! I’ve read that one key to cooking with them is learning where the “hot” and cool spots are on each. You move your pots around, depending on how much heat you need whether you want to boil or simmer, etc. I want one on our covered back porch. Then I don’t have to heat up the house to cook. This is a trick of Amish in the area, BTW. DH installed a wood burning stove 3 years ago. It is for heat. The newer ones are built with double-layer interior walls for safety. They don’t get as hot as earlier models. Cooking on them may not work well, although they simmer just fine. This wood burning heat stove heats the entire upstairs (1750 s/f), and runs us out of living room! It paid for itself by year 2 in reduced LP for whole-house heater. We filled 500 gallon LP tank last Fall (which is max. fill of 400 gallons, by law). The harsh winter had LP down to 20% by Feb. @ 20%, it should be filled again. But because the whole country had an adverse winter, we experienced a nation-wide LP shortage. Without that wood burning heat stove, it would have been a VERY cold winter! LP tank is full. Plenty of firewood stacked. Ready! And wood ash has many uses, esp. gardening. I have cooked on wood burners quite a few times in the past, and you do indeed have hot spots that require shuffling the pans around; but, you can also lift off some of the burner lids to cook with the actual direct heat when you need to. We would love one for our summer kitchen; but, will be settling for propane (LP) connected to our whole house system. 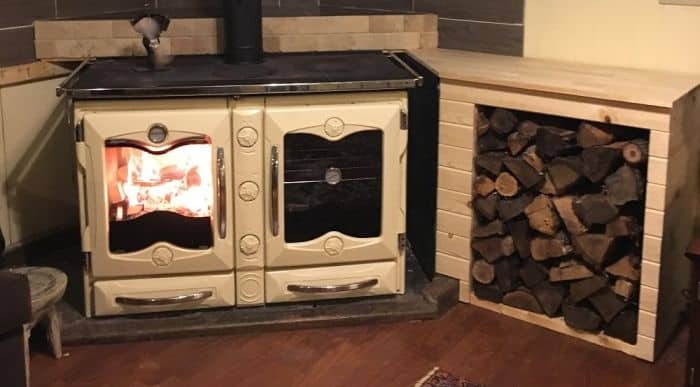 My big problems with wood burning cook stoves are that the cheap ones start around $3000.00 from Lehman’s, where we could go fetch one and bring it home, plus the installation. If you find less expensive ones, the shipping on those cast iron monsters is also cost prohibitive, since they weigh upwards of 500 pounds, meaning you need to make sure the floor where they sit is shored up to the task>. If you do end up getting one, make sure you get one with the water reservoir on the side, since you can easily keep 20 or more gallons of hot water on hand when the stove is kept running, which is another requirement, since they require some time to get going from scratch before you can start cooking. That water BTW adds another 160+ pounds of weight to the unit. That’s the intent of our summer kitchen project and it will hopefully be completed this summer for use next July and on, heating only that vented area and not the whole house. This wood burning heat stove heats the entire upstairs (1750 s/f), and runs us out of livingroom! It paid for itself by year 2 in reduced LP for whole-house heater. We filled 500 gallon LP tank last Fall (which is max. fill of 400 gallons, by law). The harsh winter had LP down to 20% by Feb. @ 20%, it should be filled again. But because the whole country had an adverse winter, we experienced a nation-wide LP shortage. We heated exclusively with wood for our first years here and keep everything in good shape as another backup source, with lots of wood stacked around the property, so I understand & agree, since it not only saves money on propane; but, makes the place just a bit warmer, since IMHO there is no heat better than wood heat. As for filling the propane to 400 gallons (80%) they often fill our tanks to 85% (425 on the 500 and 850 on the 1000’s); but, that’s because we use propane for nearly everything, and that extra 5% gets drawn down rather quickly. We just called in our summer fill and the approximately 1400 gallons will this year cost us $1.41.9 per gallon plus sales tax. You can also make a nice lye (potassium hydroxide (KOH)) solution by running water (preferably R/O or rain water) through the ash with water to leach out the chemical. This can be used for making soap or even your own hominy or hominy grits. Mixed in the dust bath for your chickens helps eliminate parasites. Set a search for wood cookstove on ebay. Every time one is listed, you will get an email notification. Wait for one worth goung after! Also, if u do an internet search, u will find a few sites that sell restored antique wood cook stoves. These guts sell new stoves, too. On wood cook stoves we have been using them for 23 years . Each has its on personality. And I hope to get another wood stove in basement level this year! Bought 240 rnds of 5.56 and 200 rnds of 7.62 by 39. Glad nothing really major happened in Oregon yesterday , there was some strange people on the antifa side…. Made you see what the golden horde might look like. 1.. How did your garden grow? 1. It grew OK but weeds grew better…LOL So did the bugs….LOL But having real tomatoes priceless…. 2.Extended family… Skills and numbers and trust. 3. Usually set weekly goals unless something happens, then I’m glad I’m a prepper…. My question? Do copper colored wasps eat tomatoes ??? I’ve never seen what you are talking about; but, will get in a shameless plug, for the possibility of being able to post photos, that could help answer questions like this one. Also, the keep my credentials or whatever the check box is called is now gone, and I have to reenter my information after each post. I hope you are right; but, be prepared to be proven wrong. More than 25 years ago we had a similar incident, where lightning struck a tree 180 feet from the house, jumped 6 feet to the overhead power line supplying the outbuildings, and came into the house to cause havoc. It fried the well pump, which proved the best ground, and destroyed a few modems and an old TV, that were replaced with insurance. All don I thought; but, over the next few months, other items simply stopped working, well before I would have expected, so it’s possible that you could have some electronic damage that causes a later failure that is hard to prove to the insurance at that later date. Good luck. Not sure about your red alert, since when I hit that page on YouTube, it shows a blank black box where the video should be, with an ! in a circle and nothing else. My thoughts and hopes for the golden horde is that they will most likely be in the population centers, far from me, and those who do show up, even with firearms, will be at a great disadvantage by our entire community who are not only armed; but, are practiced shooters and hunters. Funny we didn’t hear about this…..
My guess is the Air Force is embarrassed seeing as Thule is an ICBM missile radar site. Not that anything could have been done about a meteor going Mach 74. It could be just that it was actually a rather insignificant event. Objects fall from the sky regularly with the Perseid meteor shower later this month (peaking on August 12 and August 13) and the Leonid meteor shower coming in November. Puppy should get steak and gravy for that. Years ago we had a lightning strike that flashed across our kitchen floor in a blue bolt. Only inches from DH & DD. Took out all electronics. Blessed they weren’t hurt! Ordered some additional gun cleaning supplies. I need to make a range trip soon and #1 daughter and family will be going on vacation for a week later this month so I won’t have granddaughter to care for. I decided I’ll go to the range and clean all of my guns that week. Now that I have a sight tool for my HK-91, I can get in a long overdue sighting in on both the iron and EO sights and get them co-witnessed. In my opinion, if you can’t shoot your guns accurately with iron sights, you don’t know how to shoot. Optics and electronics are nice and very useful, but they are far more likely to break or die when least expected or most needed. I’ve been taking that CBD oil now for several weeks. It does seem to help the arthritis pain, particularly at night. I use a combination of things now that give me a decent night’s sleep. I take clonazepam (to relieve some PTSD issues that crop up early in my sleep cycle), the CBD oil, a sleep mask, and CPAP. In the event of a short term SHTF event involving a power outage, I’ll have to get by without the CPAP. A longer-term event will eventually put me down to a sleep mask only. Oh well. I’ll just have to deal with it. 1. I don’t have a garden as living in an urban apartment rather precludes that. 2. I mostly prep alone because I live alone. I do work with #1 daughter to help her prep and I am willing to have her, her husband, and of course, her daughter, join me if necessary. Depending on the SHTF event, they may or may not want to join me in my apartment. An event such as a hurricane that we are not bugging out for, will probably not see us joining together. Although we will stay in communication as much as possible. 3. Prepping goals. I have mostly achieved the prepping goals I can set living where I do. However, I continue weekly to expand my grocery stash and keep my eyes peeled for holes that I can reasonably fill. I have 2 CPAP machines. One stays in the bedroom. The other is smaller for travel. It also has a solar charger and battery pack. I bought it for traveling, but works well for the trailer too. Battery lasts 7-8 hour (new). The whole rig was about $1000, but for me a good expense. I might think about this even though the price is a bit high for my taste. Another issue is getting the thing fully charged, even if the sun is out. No, I have not tried this. It couldn’t hurt (any more than it already does). Thanks for the tip. I do a teaspoon in OJ every morning. Don’t do the this in water–it doesn’t taste good. I ordered some of that Glucosamine Sulfate and I’ll give it a try. This arthritis pain is not completely debilitating, but it does interfere with my life. The pain is not excruciating except when I try to do certain things, but it is always there as an annoying ache. The CBD oil helps reduce that ache, but does not really ameliorate the bad pain when I physically do certain things. I was waking up with my hands locked up. I had to wear knee braces in taekwondo class. Now I wake up and can feel my hands are a little stiff, but that’s it. I have full range of movement in my hands and I don’t have to wear knee braces anymore. Did you have any of these issues before taking taekwondo? I have seen people taking martial arts ending up with knee, elbow, and shoulder problems, because they were not using enough focus and would occasionally overextend and stress the joint. It’s just something of which to be aware. I hope this is the issue and you can fix it, because you are simply too young to start having arthritis problems. I’m nearly twice your age and my only problem is the occasional catch in one of my shoulders; but, I suspect the daily dose of a gram of acetaminophen is keeping that in check. My BIL gave my MIL some CBD oil for a pulled muscle. She didn’t want to use it once she found out the origin. Some biases are hard to overcome. To be honest, I haven’t tried it, but haven’t had a reason either. I had some reluctance to try it too. It isn’t the panacea some people claim it to be. Yes, it does reduce the pain of my arthritis, but it does not eliminate it. It’s simply more tolerable. I find it most beneficial at night as the reduced pain makes it easier to sleep. The bad part is CBD oil is expensive. When weed becomes legal in your State, you might want to consider using it. Edibles are less expensive than CDB, and you stand a very good chance of being able to stop taking the clonezepam. If you use a piece of an edible about 2 hours before bed, you get no more nightmares. Or so my friend tells me. I’ve restocked our Parmalat milk stash as I do about every six months. We rarely get hurricanes in Southern New England but you never know. I have tons of candles and lamp oil on hand just in case. Hired a new man to replace another whose personal life and bad decisions kept interfering with his work schedule. This new guy is a veteran and was in military intelligence. If things work out, I’ll be freed up to do more prepping and organizing. Most importantly, more time with the family. 1: No vegetable garden. With an eight year old son with autism, a small business, and civic obligations, I simply don’t have time. 2: I’m fortunate that many Lodge Brothers are survivalist minded. We are mostly veterans, armed, and we visit frequently. Secondly, my neighbors are Portuguese immigrants. They are natural preppers. Their gardens produce more than they can use, they fish daily in our nearby saltwater, they also take crabs, clams, and periwinkles. We are very close, like family. They make wine, and share it. We send over cookies, pies, etc. 3: Goals are flexible. Circumstances change daily. Ultimately, we would like to leave the People’s Republic of Massachusetts for a free state. Our trepidation is that we have a fantastic support system of friends and family here. To leave them would be a leap of faith. I don’t want to give you false hope . . . but last week scientists cured autism in mice using a new technology called CRISPR. 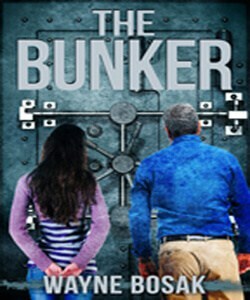 If Ohio Prepper has your email, contact him to get my email (I will email me him and ask him to send my information to you) and I will send you my lecture notes on this. I believe autism will be cured in the next 10 years. As a former Infantryman and history major, some of the technical stuff was a bit difficult to wrap my head around but the principle is clear to me. Thank you. We stay hopeful. The little guy says one word… “Da-da”. From there, we hope the floodgates will open. We’re also using IPad apps and sign to facilitate his communication. I’ll hit you up through OP. I have stories you’d be amazed by. Sometimes we get glimpses of an amazing intelligence cruelly hidden. I have sent O.P. the file with my lecture. I think you will find it totally readable. One of my gifts is the ability to take complex material and present it in a way that makes sense to everyone. I think CRISPR is something to keep an eye on. Scientists have killed the HIV virus in human tissue without harming other cells. I don’t know about a cure at this time; but, CRISPR does have promise for relief, and potential cures for single gene abnormalities. In the case of Autism, it was only tried on fragile X; but, would seem to show promise with things like Multiple sclerosis, and Parkinson’s disease. My DD had a good friend in High School with mild Autism that led her to her career in neuroscience, where she currently does cognitive research. I’ve not gotten Bam Bam’s email with her lecture notes yet; but, will send each of you the other’s email address. O.P., I sent them to you and Overwatch. I haven’t received anything with an attachment, just the reply from my emails connecting you an overwatch. I’m off to sleep; but, will check In the morning to make sure one of my filters didn’t put it in the wrong place. I love to garden, but I don’t have enough space for everything I want I try container gardening but it’s truly for the birds, you get hardly anything worthy to eat but a handful of berries. My Raspberrys do great they are in the ground my grape is finally growning I have it in the ground, and it’s trailing over my arbor. I did get 6 potato plants in the ground doing great but evrything eles I put in Pots, are just staying alive thats about it time to dig out more yard to plant in the ground. Herbs to fine in pots you need large ones to give them room to grow and thats what I have been doing. We prepare alone but do have friends to discuss things with too. As far as goals, no not really I just go along and if I find things I can use and in my budget I buy. I stopped at a thrift store, and foung a dozen small candles, two small jars of yankee candles and a britta filter all for $5.00. I do have products I buy each and every months like laundry soap cat food, but extras not unless it’s a coupon or on clearance. Going back out today to work on our small property and I’m thinking of taking the blueberries, and elderberries, to plant and let them grow. I found a small pallet, that I’m going to fix up and put the black fabric on the back and put some type of herbs in them and hang it on the fence out at our other place. I painted the tops of my picnic table, and benches, plus two benches, that sit around our fire pit, I also bought 4 chair pads for our outdoor plastic chairs, they were a dollar a piece at another thrift store just the right size and some padding so our re ends don’t get so tired on the hard plastic chairs. I know our summer is just about done only another 4 to 6 weeks of hot and then it will be on the cool down and lots of rain, so we’re trying to get as many out door projects finished before the weather changes. U sound like an excellent candidate for straw bale gardening! Small footprint, grow in tops & sides. I recommend Karsten’s book on subject – a good read! Straw bale gardening is what Matty and his lady did in town this year. They made use of the space they had while living in town to take care of his mother. Now, Matty had the greenest thumb I have ever witnessed, but his garden produced in abundance and best yet…no weeds! He used straw and tons of great horse manure compost. Here is an interesting prospective on some of Trmp’s powers Democrats beware. 1. Obama made some interesting executive orders while he was in power. Would it be right ? No but he could. 2. He also has the right to pardon anyone he deems necessary. Maniford ,don’t worry, Trump’s got your back. 3. DACA is illegal….. The 9th Court ruled on this. Technically Trump could therefore roundup all illegals and kick them out. It is already a law and judges can only rule on the law not make the law. 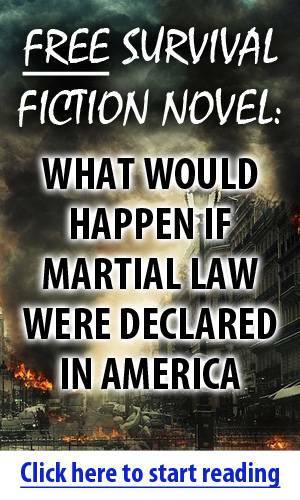 And that’s just the short list of Acts of Sedition starring Barry Soetero, aka, Barack HUSSEIN Obama, the Kenyan Bi-Sexual Occupier of the Rainbow House. Thor1, I am just asking for clarification–I thought only foreigners could be held indefinitely as enemy combatants. Military personnel are covered under the Geneva Convention. U.S. Citizens are covered under the Constitution. “Enemy Combatants” have a gray status of neither being protected by the Geneva Convention or the U.S. Constitution. Bam, nope, foreign or domestic…….. In the end everyone had a great time. I was so exhausted that I slept in until 1 p.m. this afternoon. My dh went to church by himself. He didn’t even think of waking me up. We didn’t do a garden this year. It took me a good six weeks to recover from pneumonia and after that it was too late to start plants. I am glad, no one around here had a good garden. We just had too much rain. The rainfall totals for June and July set all time records. I am sure August will follow suit. Tara, I loved the story about the Easter egg inspired potato hunt. I gotta ask, what is cowboy caviar? TOP, there is a ton of recipes on the interwebby. Dip/salad/side dish with black beans, black eyed peas, corn kernels, tomatoes, avocado, other vegs as desired, and a vinaigrette dressing, can be served with corn chips. A friend of mine makes a variation of this as an appetizer/dip. there is a ton of recipes on the interwebby. Dip/salad/side dish with black beans, black eyed peas, corn kernels, tomatoes, avocado, other vegs as desired, and a vinaigrette dressing, can be served with corn chips. A friend of mine makes a variation of this as an appetizer/dip. Thanks, I looked it up and see it now; but, I generally ask, because I’ve looked up some things and have gotten them wrong, since there can be regional differences. For instance, there are still some people in Ohio who insist on calling green bell peppers, Mangos and will often argue with you about the term. You bet you they do as Pennsylvania ridge runners also call them that. When I was first married I went into a grocery store in NJ looking for mango’s in the grocery store and found green peppers but didn’t buy then as I thought they were hot. Hey Tuckerhollow! We all did “goofy things” back then. I was once young and stupid. Now I’m just an old fool! I’m not sure what a Pennsylvania ridge runner is; but, I assume eastern PA of you were shopping in Jersey. I grew up on the real ridges of the Allegheny range of the Appalachians in western PA and we called them bell peppers. We however did have our own vernacular, like someone being “nebby” or “Reddin up for yunz” and would often make samiches with chipped or chip chopped ham LOL. Born & raised in Central PA, home of the p cub. I think our mountains are the Bald Eagle. I was shopping in NJ because I had gotten married and we lived at the jersey shore on the beach. Think we were called hippies, that was before Woodstock and were definitely called hippies after we got back from Woodstock. All that peace and love you know. I was born and raised in Johnstown, a once great steel producer; but, most famous for it’s floods. All of my family missed the big one in 1889; but, my parents and maternal grandfather lived through and had stories of the one in 1936, and the parents and siblings were there for the one in 1977, where the water in the basement was just below the top step of the basement stairs; but, a block down the street at the home of some cousins, it was level with the piano keys on the first floor. I was already in Ohio 4 years into my first job after college and could only hear about it on the news, since communications back to Johnstown was pretty much cut off, except for a few ham radio connections to friends back there who lived above the fray on the hills. that was before Woodstock and were definitely called hippies after we got back from Woodstock. All that peace and love you know. Woodstock happened in August of 1969 and although I had friends going who invited me along, I was working a summer job to raise money for college since I was leaving in September. During my last few years in high school, I had to shave twice per day since beards were not allowed, so the day I graduated, I started growing a beard that I have to this day. I guess I was also considered a hippie by some, simply for the fact that I had that beard. It was pure stereotyping, since I didn’t know any hippies who went out to the fields and regularly shot and hunted as I did. Peace and love didn’t seem to play well with the 2nd amendment, even back then. Reddin up is cleaning up house usually, but could be cleaning up almost any space, my poor husband had the hardest time when we were first marries at some of the things I came up with, I still say sweeper instead of vacuum cleaner. So you are almost a Yinzer, eh? I still say sweeper and the wife no longer even blinks; but, after 36 years she’s come to expect the occasional odd word or phrase, and I no longer even have to defend them. I have a pin on button my mother got for me after the 1977 flood, that simply says: “We’re reddin up for yunz”, and there could not be a more succinct example of that culture and language. Ohioans as it turns out also have their own odd words and phrases. 57 years? That makes you a bit older than me, since I would have been 10 when you were married. In any case, it’s nice to commiserate with someone who speaks the “language”. I’m 80 and plan to live to108. Welcome TuckerHollow. Y’all mean to tell me that only Ohio folks say, reddin’ up, lol. My Bobby puts an “r” in wash like so many here do and it absolutely drives me nuts. One of the young guys in our tribe recently used his finger to write “Warsh Me” on the rear view window of our daughter’s SUV and I so had to rub all that poor grammar away asap, lol. Your example of “Warsh, as in warshin clothing” was one of the example I was thinking about when I stated:Ohioans as it turns out also have their own odd words and phrases. above. Some here can confirm that I am sort of the spelling and grammar Nazi; but, I do generally try to hold my tongue, since on a forum like this one, autocorrect can often use words you did not intend. As a retired degreed engineer, precision has always been part of my life; but, I started out living next to my maternal grandfather who taught high school math and English back when grammar, spelling, and even penmanship were part of the curriculum. Growing up in my household, “ain’t” was as much a four letter word as the other more crude ones, and verb tense still makes me cringe, when I hear people say things like “we was” instead of “we were”, LOL. Corn, black beans, diced red onions, deseeded roma diced roma tomatoes, finely diced red hot peppers, olive oil, cilantro and spices. It’s a dip for tortilla chips. Yum. I wonder if this is a southern thing. Thanks for the recipe. The reason I asked was the word “cowboy” as in cowboy candy. I had never heard of that either, and when I found out it involved hot chili peppers, I knew why? The DW and I just don’t like chili’s ala, jalapeno and the like, with the DW being especially sensitive. I do however like Chinese hot like Szechuan peppers & pepper oil. The oleoresin capsicum in the chili peppers does however make a great self defense spray, which tells you a lot about their ability to incapacitate, LOL. where I came from “ridge runners” of any kind. were said to be moonshine haulers. Glad to hear the wedding went well, Bam Bam! I know you were stressing about it. New grandson arrived last night, Baby Allen, 5 lb 7 oz. Mother and baby doing well. We’re planning to visit at the end of the month. Received the copy of “The Forgotten Skills of Cooking” by Darina Allen that I had ordered. Just finished reading it. A lot of good, basic (some more complicated) recipes and techniques. Not much else for preps this week, it was busy at work, rainy yesterday, and too hot today to get outside and do yard work. Two tomato plants in pots on the deck – that’s the extent of our garden this year. I wasn’t even going to do that, but I stumbled upon a vendor at a farmers market that had a lot of good heirloom varieties when we were in Vermont in early June. Locally, we prep alone – we know our neighbors but this isn’t the chummiest neighborhood – though I have discussed it with family members, the closest of whom is 2 hours away, but they know they can come here if needed. (Ergo the hand pump for the air mattresses.) No goals, just filling in holes as needed. Thanks Mainbrain. The other mother is was diagnosed with stage four bone cancer, after going through chemo and radiation last year for breast cancer and a brain tumor. The wedding was rushed so she could attend. So that meant much of the planning fell upon me. Oh dear, so sorry to hear about the other mother. I guess that explains a lot of the “we can’t focus on planning” by the bride and groom. Good on you for pulling it all together. Congrats! A new baby boy in your tribe! Indeed! A second anchor baby, woot! Thanks! A second anchor baby, woot!! So glad for u that all went well! Thank you, LTD. I haven’t focused on prepping for two or three weeks. IMCO getting our kids off on a good foot counts as prepping. So glad the wedding and reception went well. I laughed so hard at the thought of your deer in the headlights husband, I bet that was a hilarious sight to behold. Auddie always makes every chore entertaining! 1. Gardening results were not worthy of mention except I have dehydrated basil, calendula and lambs ear. 2. I have 3 siblings fairly close that prep. Together we have a variety of good skill sets. DS is 2 hours away, but helps me a lot. His job situation may change late in the year and he’d like to work in this area. 3. I have a list of goals, but seems like lately I’m more reactive than active. With no rain the priority has been to put up fresh produce whenever I can find it at a reasonable price. I was out in the heat a little too much and also got a slight intestinal issue, but back to normal now. Dehydrated cabbage, poblano peppers, snow peas and lots of Mexican gray squash. Also 5 beautiful cauliflower at $1/head. Am getting used to my ComforTac ankle holster for the 380. Works great for riding too. I have a Cashel ankle safe on the other side holding a spare mag, cell phone, folding knife and shoe strings for bridle repairs. DS is going deer hunting for his first time and I’m excited for him. Told him I would buy half. Logan charged out into the pasture toward a coyote and I thought this is going to end badly. After much posturing and circling, I think they decided it was too hot to fight. The coyote continued on his path with Logan following a few feet behind. After the coyote went thru the fence Logan came back to me and he got hugs and cookies for being a diplomat. Tara, I like your writeup and stories. I had a little dog similar to yours at one time. So cute. hummingbird: pls let us know how first hunt goes. What part of the country are you in with no rainfall? We’ve had record rainfall here in Florida. We have family in Louisiana and Texas, and they’ve had tremendous amounts of rain. I’m in NE TX. Rain is in the forecast for next week so we’ll see. Rain like you are having has its issues too. We’ve got family in SE Texas and they are getting a lot of rain. North Alabama: we just had first measurable rain in a month. Everything was turning brown & ready to drop. It was high of 97°f here yesterday, with high humidity. It is now 73°f & raining. woo-hooo! Logan sounds like a sweetheart – lol on being too hot to fight! Thank you for your compliment. I love my spunky beast even on days I have to bite my tongue and repeat that phrase to myself while she causes on type of chaos or another. More flipping fires in n calif. I was kinda worried last night but nothing hapend except smoke. got a lil bit of ammo and checked out our tent trailer. The canvas in the front and rear needs some help. Other than that all is ok.
Axelsteve, Been wondering how you were faring… Glad to hear that you are ok. Take care and stay alert. The people that start these fires have no problem with killing others. Tara, thank you for adding dates! YES! it makes it easier to check on a post, to make sure have not missed anything. I like current info, don’t usually go back and read a post that is more than a week old unless it pertains to a specific subject I need to hone up on. I try to read everything, I am interested in, as they come out…but sometimes responsibilities are heavier than at other times. and I have to go back. I hopw I don’t come across as some kind of sourpuss, but I don’t really care who is first to post on this site! Hi Sourpuss 🙂 Welcome to the Wolfpack. Have you considered making your own Epipens? O.P., our resident engineer, might comment on this. Thanks Bam. Unfortunately for DW, she has allergies which require her to carry an EpiPen and she gets two per year from the insurance company. She is always careful to get pens which have at least 11 months to expiration date, so her rejects still have years of usable life. Due to timing, I have six viable pens. As far as the sourpuss appellage, it’s the least I can do! I’ve been posting on thesurvivalistblog for a few years, but have had a hiatus for most of the past 9 months due to a medical situation. Back in action now. Anyway, I am a long time prepper, always eager to improve our situation and be realistically better prepared for unforeseen disaster. No apology necessary on the who’s on first or the what’s on second debate for that matter. I really don’t care; but, do like to tweak those who do on occasion, just for fun. It sounds like Billy has his situation in hand, and I think the MIT Technology Review isn’t suggesting you build your own, as much as showing that it can be done and what it actually costs. As I understood things and the article confirmed, the situation had to do with the patent on the auto injector mechanism, which is a two edged sword. If someone makes their own or a cheap version and it fails, someone could die; but, the R&D needed to make it as fail safe as possible, costs time and money for engineering, testing, and quality control in manufacturing. In engineering we have a maxim: “You can have it cheap and fast” or “well designed and tested”, pick one!!!! I was thinking about how to make your own post-collapse when there are no pharmacies open. Somehow in the back of my mind, I thought that was the point, and I was kind of thinking the same thing, and even considering potential ways to 3D print the device. The real problem post collapse however, will be getting the epinephrine to fill the syringe. While it has been synthesized since 1901, it would take some real chemistry expertise and equipment to make the compound, and that is well beyond anything I would attempt. Hey BillyT, glad to virtually meet you! Atropine and epinephrine are two very different drugs and do different things. Atropine is a manufactured drug. Epinephrine is a naturally occurring hormone although it has been synthesized such as in EpiPens. Atropine is used in certain kinds of nerve gas and pesticide poisonings. It is also used in certain types of slow heart rates in order to speed them up. It is not a naturally occurring hormone. It is not a universal antidote to most poison gases. Epinephrine is a neurotransmitter and used in cardiac arrests to increase electrical conductivity in the cardiac tissues, it is also used to decrease the effects of histamines in allergic reactions (thus the EpiPen). Unless the poison gas is made out of something a person is allergic to, say a shell fish gas, epi will have zero effect except to probably increase the heart rate, which does nothing for the underlying poisoning except speed it around the body faster. These medications cannot substitute for one another as they have different mechanisms of action on different bodily functions. I’ve used both when I was a paramedic and never for the same things excepting cardiac arrests. Atropine was administered when the heart was in asystole (flat line) in an attempt to get some electrical activity (fibrulation) that epinephrine and defibrillators could work with. It is no longer used for that purpose since 2010 as it was found to be ineffective, as any practicing paramedic could have told you years ago. Thanks Zulu. I appreciate the info. Actually, I think a poison gas attack is one of the least likely major disasters. The sarin attack on the Tokyo train illustrates the difficulty of widespread gas attack. I should have consulted my son. He is a certified EMT! Sarin is a nerve agent, so atropine might be useful in that case. The military issues an atropine auto-injector (same as an EpiPen, just a different drug) to each military member in a combat zone where chemical weapon use if possible. We had them in Desert Storm. They come in sealed foil type bags and are inspected on issue and on return. You got in trouble if your atropine injectors had been tampered with. If your atropine injectors were in foil, you must have gotten the newer bulk manufactured ones after Desert Shield started. In Germany, ours were in OD plastic tubes with a seal over it. And you’re right about getting in trouble if the seal is tampered with. I asked my doctor about getting one and he said a firm “no” on that and explained that unless you get hit with sarin gas, they’ll do more damage than good. Speaking of chem gear, those plastic containers that hold the chemical test wipes make really great waterproof containers. And they float. If you can get a hold of one of the chemical charcoal suits at a surplus store, I can tell you from direct experience, they will keep you warm in the winter. Just wash it a few times to get all the charcoal out. We all had one that we used for training, and it got a lot of use and a lot of washes. Either S. Korea in the winter or West Germany in the winter… sometimes we would just put them on instead of long john’s or sometimes with long john’s. Yeah, that atropine will definitely mess with your heart rate if you don’t need to use it. Yes, those plastic boxes for the wipes are super for keeping small items dry. I have several. Everyone in my Guard unit had a training set of MOPP gear that was well washed out. As you point out, they’re still awfully warm even in cool weather. Very easy to dehydrate in those things. We also cut out a piece of the mask filter behind the air inlet. That made breathing very much easier. Thanks for your explanation. I was thinking the same thing from my understanding of the medications and their effects; but, I have no real expertise other than a lot of reading and multiple level first aid classes, and certainly didn’t want to question anyone who perhaps has different expertise or experience than I have. The great thing about this community is that between all of us, we can probably solve most problems any of us might encounter. Glad you mentioned protein powder; I need to check qty on hand. #1Glad to see you are back! #2Don’t worry you are not the only one who doesn’t gave a rats buttermilk who posts first. #3 a couple of ideas for when you get the protein powder, and are planning to use for long term. ..pack it very tightly in large mouth quart jars… include a scoop. and label info needed to use inside the jar…..put the manuf. best by date on ouside for a reference… Pack with a oxy abosrber. can used a good, clean used lid for vacume sealing..most effectively.. start checking 5-6 months past the best by date. ad you will find how long you can use your brand past its date. take a serving out and reseal til you find out…the true expiration date. any old dry goods like this or cornmeal can be easily rotated thru for chicken feed.. Some of mine go several months past the best by date and some only 3, depends on the ingredients. I don’t think you need to repack most protein powder. My dad would buy it in bulk and use it every day for his “goop drink”. They usually come in vacuum sealed containers or pouches and can be stored for years. He found a half-case he had forgotten about and it was years past the expiration date. He said it tasted just fine. Anamo and Sirius. Thanks. I agree. Almost everything I have tested or researched is good long past the published date. I’m tracking my current favorite brand to see how long it is good. Currently buying Integrated Supplement brand. Moisture content seems to be very low, so I see no reason why it wouldn’t have long shelf life, although I think I will vacuum seal a quart or so with a moisture absorber enclosed, as an additional test. The reason I posted it, I got some opened and only used about half before it was bad. I need i occassionally, depending on gastric condition, tolerances vs intolerances…. I don’t use it daily , more like weekly or bi-weekly… so I lost some. a few months apart. I have found adding it to pancake mix helps keep the pancakes from causing blood sugar crashes…so like to keep it for back up. I have resealed some in pints..instad of the bigger cannisters. Believe it on the Coconut Oil! The coconut restored my Dads memory . I also gave him citicoline once daily. if he missed either , His memory was worse in 2 days. I don’t think you need to repack most protein powder. My dad would buy it in bulk and use it every day for his “goop drink”. In general that’s true. Protein and carbohydrates are relatively stable when kept cool and dry. Dry packed sugar doesn’t even need O2 absorbers, and if used they cause the sugar to clump. The biggest long term storage problems are with fats that will go rancid as they oxidize. Our long term fats storage is olive oil stored in the freezer; but, having other fats around like bacon grease, or butter made from cream may be a better long term SHTF type fat. We have done the same with olive oil, but also have quite a lot of coconut oil stored in the cool of the root cellar, in addition to some in the freezer. BTW, coconut oil in addition to being an excellent cooking oil, is reputed to have anti-Alzheimer properties. And, both olive oil and coconut oil increase HDL, so they are excellent dietary choices. I saw Dinesh D’Sousa movie Death of a Nation tonight and it was fantastic. I recommend everyone see this movie, and I’m going to make sure my millennial kids see it too. He describes the history of the dems and republicans, and explains fascism in an entertaining way. I rarely go to the movies anymore, but I wanted to see this one. I’ve bought his other movies so I can show the kids, so I’ll probably buy this one too. We rarely go to movies; but, the DVD’s generally come out rather quickly and inexpensively, especially for small budget documentaries like this one. I will eventually see “Death of a Nation”, probably on DVD in my home, since the cost of the DVD is usually less than the cost of driving the two of us to a theater and buying tickets, even if we don’t purchase any of the overpriced food. At home the snacks are almost free by comparison, and we can pause the movie to take a break for whatever reason might be required. The last movies we saw in theaters were the Atlas Shrugged series and I later purchased that entire DVD set for $13.00. We purchased “Obama’s America”, which is another good one. As a history buff I really didn’t learn much from it, nor do I expect to learn much from the new one; but, having them on hand to show to others can be beneficial. History in this country has been so watered down and politicized to the point we may be spiraling down the drain with no way to stop it. When I see socialist Alexandria Ocasio-Cortez discussing issues about free stuff for all, you wonder what she actually learned with her economics degree from Boston College. She obviously just passed through without paying much attention. I have to wonder what her GPA ended up being and wonder if this is just another case of affirmative action at work. That is the truth about the snacks. We are trying to lose weight, so we ordered a one small popcorn and one medium drink to share, total was $12.00! Hiliary’s America is another one of his movies we bought. It gives a good historical perspective on the Democratic Party, very eye opening. I don’t do theatres & have not for years. I’m not going anywhere my weapons aren’t welcome. I concur; but, in our case for the Atlas Shrugged series, our whole MAG attended and were all well armed. We were well armed too. We don’t go to movies, but we made an exception for this one. My garden is toast, too much of a Kansas summer. Farmer buds say they may lose both corn and bean crops, not good. Outside of a local Full Spectrum Preparedness group (they are good people and try to help others), I’m lone rangering the prepping thing. Missus tolerates prepping I can’t say she supports it. Looking at relocating outside the city, Missus isn’t a happy camper. I don’t prep by ‘time’, usually pick a topic and work on it. Currently working on medical preps. Yes, I have some holes in my preps. I have a new Cub Cadet RT 45 tiller, it won’t hardly pull itself. No traction at the wheels, has to be pushed along. Not happy to say the least. Any comments? The misses will come aboard after an event comes along even a small one will do. Just keep on doing what your doing, and she will see your purpose fast enough when it happens. We have prepped in earnest ever since we lived in upstate NY in the early 70’s if for no other reason SNOW which can keep you at home for a very long time. We were so far north we may as well been in Canada 4 mile off the border was just about there. Keep the faith. Hey, Sarge! Welcome to the conversation! Welcome Sarge. Sorry you aren’t getting any rain either. A sister who lives in SE Kansas visited a month ago and said their pond was almost dry. Hang in there. Look at the things your DW does, and see if any of those could possibly be used to create gifts or needful items. Any thing she already does and enjoys..could be a possible source of small income .. Encourage her to increase her skills and supplies in those areas she already enjoys. Don’t have to even mention the end goal is to have her engaged to be able help with some ability. In time of crisis, and havig to remain inside because of weather or other events could give her something to fill her time with productiveness. . Does she love to make jelly, ajms or preserrves of any flavor that is not commonly available. orange pineapple jam? ( we can’t buy that here anymore)… Red Plum jam, makes some wonderful Plum Chicken… Ay other special recip she loves , that can be canned for laer instant opened meals. Some other. examples.. Crochet can be used to make stuffed animals, dolls, dish cloths, dish towels, scrubbie pads if one has the talent or is willing to learn. having materials, supplies and patterns to use will be important… My daughter does plastic canvass work, she makes christmas and birthday gifts. for DH , and other family and close associaes. again having supplies, thread, patterns, needles, scissors are necessary. This is how I grew up, with mom and dad buying bulk on sale, mostly to save enough money to feed me and my three siblings. 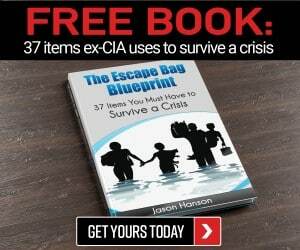 I think the best way to get someone on board is to talk about the practical aspects of bulk purchases and DIY without ever mentioning the words prepping or survivalism, since often those words alone can be off putting. Once they have started seeing the practical things the lifestyle offers, like more cash in your pocket or being comfortable in a blizzard or when the power goes out, then the term can be introduced. Encourage her to increase her skills and supplies in those areas she already enjoys. Any time a hobby can turn a profit it’s a good thing, and if it’s something really enjoyed, it can be done more if it doesn’t cost funds needed for other things. I have been enjoying that site! LTD, I am so glad that you are. It is my second favorite place to write, here being the first, of course. If any of you are new to large survival homesteading life, plan to buy a medium or large homestead as part of your preps, or heck – just want a peek at my little slice of heaven on earth. We’re already mostly there with our 8 acres and 1/3 interest in an adjacent 200 acres, 178 of which we cash rent to someone. We get down to your neck of the woods on occasion to visit with friends in Athens, Amesville, and Glouster, and might like to see your place and you in person. Likewise, if you get to Columbus and want to visit out here, we’re only about 30 miles northwest of Dublin, and could surely at least find something good to eat with a little heads up. Looking at your bio, I can do most of those things except for tapping maple trees, which we plan to try this fall. About 30 years ago we planted sugar maple saplings from ODNR division of forestry, back when they still had tree nurseries and sold bundles of little trees cheap. If you tap my name you can send a contact email and as many here will attest, I do keep OPSEC; although in your case I have a rather good idea of where you live, at least from the city & county perspective. OP, I would LOVE to have you come visit! My dad was a teacher, principal, and coach in Glouster for years, I had a lot of misspent youth there myself, I am willing to bet there is a better than 50 percent chance I at least am familiar with the last name of your friends. I am originally from Athens County. I have family in Columbus, Dublin area and Grove City. I clicked on your name and it took me to OP.org but when I click on the email link nothing happens. Happy to share my email with y’all it is simply my first and last name at gmail. My maiden name was Bunting, maybe one of your friends in my region known some of my clan. I just clicked on my name and the email link on the page there and it brought up an outgoing email to: [email protected] as expected. I have no problem sharing this, it’s just that on the other site, URLs & email addresses put you into moderation, often for hours or longer; but, the link on the name always just worked. My friend & his wife in Glouster have only been there a few years. Their last name is Bennett. The friend in Athens was Chuck (Charles) Bennett who was married to Victoria Tong, whose mother and father were professors at O.U. Her mom is gone and James (Dr. Jimmy) is now professor emeritus in forensic chemistry. I have a meeting tonight; but, will drop you a note later or tomorrow. I’m not sure of our plans to get down your way right now; but, it’s something we do and that is now long overdue. Jon (and Ann) Bennett in Glouster is the younger brother of my late friend Chuck. TOP, you tap sugar maples in the late winter/early spring, when the sap is rising – not in the fall. Maine Maple Sunday, when the sugar houses open for tours and samples, is always the 4th Sunday of March. If you tap this fall, I suspect you’ll be disappointed with the results…. I stand corrected – Just looked it up – it is possible to tap maples in the fall, but you don’t get as much sap or sugar, and the trees then need to rest for a year (i.e., no tapping in the spring). Just looked it up – it is possible to tap maples in the fall, but you don’t get as much sap or sugar, and the trees then need to rest for a year (i.e., no tapping in the spring). I think I recall that it’s possible in the fall also; but, things are too busy to get anything more than equipment ordered in this timeframe since I also need a place to process the sap. I really don’t ”see” any tapping here except spring. In any case, thanks for the link, since that website might be a good resource for the subject. you tap sugar maples in the late winter/early spring, when the sap is rising – not in the fall. Maine Maple Sunday, when the sugar houses open for tours and samples, is always the 4th Sunday of March. You are of course correct and I misstated my intentions for the fall. I was planning to tap early this spring; but, time got away from me, and when I saw bags and buckets hanging on trees all around, especially in the Amish areas, I realized I had missed the mark, since purchasing the taps, and bags while on my list, had not yet been accomplished. Our maple trees are in an area that has started to convert back to forest and all of the maple trees have been marked, so the plan now is to purchase all of the taps & bags this fall, and to get something of a sugar shack set up and try to be ready for spring. I found what I need on the Rural King website; but, they were unavailable in the stores when I tried to purchase them to try this last February. As with many things, more planning is needed here, so we’ll be ordering the needed equipment shortly. Ohio Prepper, You should venture down to the Hocking Hills for the annual maple sugaring event at the state park, it is a lot of fun and informative, as well. This winter was so hard to tap around here. Getting the temp warm enough during the day but not so cold at night the sap would actually run was a nightmare. My nephew in a neighboring county had far more luck on my old land, than we did. I tap a variety of trees, not just maple. Maple is the best producer, but I think it is fun to try out the other flavors. I wish we had more birch trees, the syrup from it tastes like butterscotch. We have the RT 65 and it works OK; but, you do sometimes have to push down o nit when breaking ground, to keep it digging in. It replaced (physically but not functionally) our 34 year old Troy Bilt 7 HP Horse, and the old Troy Bilt sometimes needed extra weight on the back to hold it down even though it weighed a lot more. The biggest thing I miss from that old Troy Bilt was the Hiller Furrower attachment. Just back from a quick trip to the East. I traveled quite a bit last week but still managed to make a couple of batches of peach jam and two different peach salsas. Multiple batches of pickles too. The two of us are eating well off the 30 ft. x 40 ft. garden which is supplemented by 4 raised boxes and a side garden near the house that is roughly 3 ft. by 75 ft. I do the lion’s share of the prepping with full monetary support from DH. His work week is beyond the 40 hour time frame. No close friends prep and we don’t talk about it outside of immediate family. The kids would try to make their way here, although the oldest could also go to in-laws who live in an amazing location for bugging out. If a natural disaster occurred we would head to MIL’s less than 100 miles away. I need to be better about setting goals. Right now just trying to put up any extra produce from the garden. Well, the tomatoes are starting to ripen! I am going to recommend Brad’s Atomic Grape tomatoes…got them from Baker Creek Seeds (www,rareseeds,com) on a whim because they looked pretty. I had 100% germination. (yes, they are heirloom) I have two plants in the garden, and two in containers. The garden plants are much larger than the container plants, but both FULL of maters and still blooming (I staked, but will cage next year). THE SWEETEST tomato I have ever tasted! And these are NOT grape sized maters, much larger, even as large as some of the smaller Rutgers I am getting. I am planning to dehydrate any excess for snacking. Yellow pears, getting a handful ripe every day. Rutgers are just ripening. Dads Sunset orange are heavy with fruit but not yet ripening. Snow pea plant is about done for the summer, but I started several more for a fall crop. So yes, we garden, LOL, to answer Tara’s question. Containers can be tricky things. It has to do with the size of the container as well as the soil mix you use. You also need to fertilize containers regularly, as opposed to an in ground garden, which only may need periodic fertilizing. Just my two cents, having done containers the past couple of years rather than ground gardening. We don’t have a ‘group’, we pretty much are on our own. One neighbor is sort of like minded, and we share garden abundance, and expertise in other areas. Our kids have learned from us, well some of them anyhow, and DD home is a potential BOL for us. I do my best to maintain a well stocked pantry and other supplies. I was unemployed for a length of time, and ended up with a minimum wage job after having a much more ‘comfortable’ income level. Our preps helped us through that rough patch big time. But building things back up is a little harder than it was before. So, there is no ‘time frame’, its a matter of doing what we can with what we have. And we do continue to add to our preps. It sounds like this was an overall good week for everyone, that is always a good thing to hear! Love and prayers for all! Don’t forget to vote Tuesday, if you have an election going on! (I know my OH peeps know the importance of this special election) I will as always, be late to the party next week, but I will be sure to pop in! TOP, I will get in touch with you after we get back! i’m in my 4th year of bee keeping. last week we did our 2nd harvest of the year. we ended up extracting 20 gallons of honey , from i think 7 hives. we keep hearing about colony collapse disorder, personally i don’t believe in it. i suspect it’s more from wax moths from your yards. bee s simply won’t tolerate them. so far i am catching a few swarms and loose a few every year. it works out in the end. we sent a bit down to kentucky for hostess gifts at the house. we had family staying at. little did we know, they had some hives and harvested 2 weeks earlier. with growing seasons splits, between here and there. we should of both been in the same planting schedule. alfalfa /echanatia/chamomile, should of been in the same bloom time. taking in geographic location splits. anyways they did a blind taste test, mine was the winner of 8 diffferent samplers. mine was cleaner, sweeter better flavored. I trust u r a member of an apiary group? Got my first hives this past April – 2 of them – I am very pleased with progress. OP has my email address. Wud love to be able to “pick ur brain”! BLACK used to post on the other place as BLACKBQI. He is a friend, ham radio operator and MAG member and lives about 5 miles to my southwest. He is a dairy farmer and a master gardener, along with keeping bees and has supplied me with lots of excess vegetables. As soon as I can clear it with him, I’ll pass on his email to you. To answer your questions… we prepare to the extent we are able, with goals in mind but, as a whole picture. Not necessarily, item by item but by category, unless it is some big thing. Those we have to save for. We prepare for lifes setbacks…primarily alone with an eye to help other family and as we are able. To get things we need we cut expenses on some routine expense by some kind of hack to get things we determined are most needful. We watch for sales and will juggle a “need” to a “buy” if can save significantly. Other people in the area prep to some extent. Those who grew up in the great depression and the children of those who learned life’s lessons the hard way may have been hungry or scrappin’ to keep everyone eating- have a great desire to not be hungry or in serious want again. I got 20 more baby chickens this week.12. americana’s, 2 pullets in RIR, and 6 Columbian Wyandot. they are all doing well. added to filtered water stores,.. Picked up a few first aid supplys bandaids, hemmoroidal treatment, awesome powder for laundry treatment. Made up another 8 lbs of ant feed and fed them..made up some laundry detergent… worked in yard and garden…set up some raised beds in big tubs…planted a few things. for fall garden… repotted some house plants. few veggies from garden… but we did get something this year., better than last year! few tomatoes, okra and cucumbers. too early to know on sweetpotatoes. Keep on Keeping on! Hang in there! stay alert and focused- on what you have determined you need to do or be. After a year of planning, sweating, traveling and negotiating I have finally purchased my little slice of heaven in Northern Central Michigan. A house with 5 acres surrounded by hundreds of acres of privately owned and state owned woods. My nearest neighbor is over 1/2 mile away and everyone seems to keep to themselves around here. Our house is downsized from my previous home but with plenty of storage room, in sheds, and pole barns. It also has a stream running through that has annual sucker and pike runs. My house is heated with two wood burning stoves and has a solar water heating system. I have generator back up power, and I already have my garden plot set for next spring. I have deer and turkey in my back yard and plenty of other hunting and fishing opportunities. Things are look good. Congratulations on the purchase. I have a dear friend who originated from that part of the country. She tries to visit each year about this time. The stories she shares are wonderful. Maybe I can visit that part of the country some day. You should venture down to the Hocking Hills for the annual maple sugaring event at the state park, it is a lot of fun and informative, as well. Since I no longer drive, I don’t go to many of those events anymore; but, have gone to the mapling demonstrations in the hills, and spent a lot of time in the various parks, sometimes taking people to try rock climbing and rappelling. They are gorgeous places; but, can be equally treacherous in winter. Ask me how I know, LOL. This winter was so hard to tap around here. Getting the temp warm enough during the day but not so cold at night the sap would actually run was a nightmare. I’ve helped others and have a good idea of how it’s all done; but, here it wasn’t the sap run as much as the sugar content, since this past year has been nearly monsoon like with the rains. The typical sap to syrup ratio is around 40:1 and this past year it was more like 70:1. I tap a variety of trees, not just maple. Maple is the best producer, but I think it is fun to try out the other flavors. I wish we had more birch trees, the syrup from it tastes like butterscotch. We have several varieties of maple; both sugar and silver, plus box elder and lots of black walnut, and plan to try them all. I don’t recall seeing any birch, which I’ve looked for, since birch bark is some of the best natural tinder you can find.